No athlete wants to spend time on the bench due to a sports injury. Whether you only play for fun or you compete to win, you need to understand how these injuries develop and what you can do to overcome them. Here are some frequently asked questions on the subject from our Plano chiropractor at Willow Bend Chiropractic. What Are Some Examples of Acute Sports Injuries? Acute sports injuries are those injuries that occur due to a sudden impact or structural failure. Examples include dislocated joints, blows to the spine that herniate discs and force vertebrae out of position, ruptured ligaments, and torn muscles. How Do Athletes Develop Chronic Sports Injuries? Unlike acute injuries, chronic sports injuries are the result of long periods of overuse, poor posture, and/or repetitive motion that do small but cumulative amounts of damage to the body, usually resulting in pain, inflammation, and loss of function. Improper sports technique or an undiagnosed musculoskeletal misalignment may make you more prone to such injuries. What Are the Most Common Chronic Sports Injuries? Examples of common chronic sports injuries include carpal tunnel syndrome, tennis and golfer's elbow (both forms of tendinitis, but involving different elbow tendons), rotator cuff injuries, runner's knee, strained neck or back muscles, and plantar fasciitis (chronic inflammation of the arches of the feet). 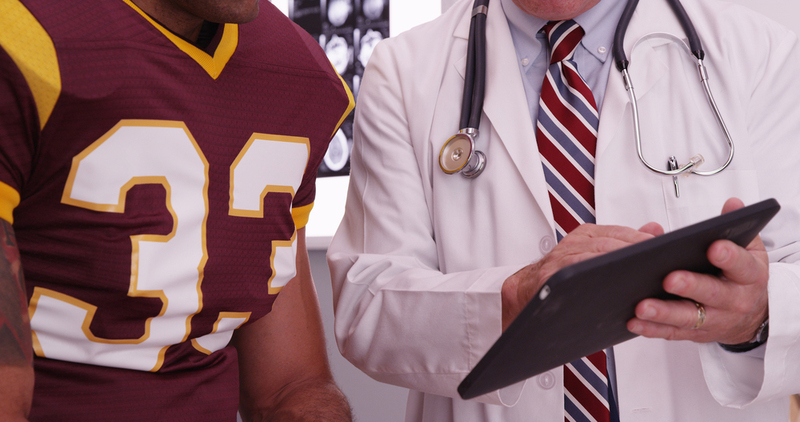 How Does Your Plano Chiropractor Treat Sports Injuries? Our Plano chiropractor evaluates your symptoms while observing your body in motion to see how your injury has affected your physical function. Examination of your musculoskeletal alignment can help reveal longstanding joint issues that may require correction. We can then create a sports injury treatment plan for correcting the underlying cause of your condition, thus relieving your pain and helping you regain full control of your body. What Kind of Treatment Plan Can I Expect at Your Chiropractic Clinic? Chiropractic adjustment and massage make a powerfully effective combination for treatment of many sports injuries. These treatments allow us to optimize joint position and function while also relieving strain-related pain, inflammation, and muscle spasms. You may notice your symptoms receding from one treatment session to the next. MLS laser therapy is another natural option for easing pain and accelerating the healing process. Can You Help Me Prevent Sports Injuries From Occurring? Our chiropractor can indeed help you protect your body against future sports injuries. We can recommend preventative strategies such as periodic chiropractic wellness checks, proper nutrition, and best practices for keeping your musculoskeletal system fit and balanced. Ready to win the battle against your sports injury? Call our Plano chiropractor at 972-608-4411!